In pursuit of these alternative environments of reality, Lyle builds “multiple architectures and rooms within rooms” by angling large frame structures that evoke walls, though porous, sloped, and oblique. Moving through and amongst these structural arrangements, one encounters objects: prints, images, photographs, fabrics. It is, literally, like a tilted framework through which one perceives colors, landscapes, and textures. In a different yet related work, Lyle projects an “abstract portal image” on a front door, its outline at odds with and yet literally shaped by the actual door’s corners and edges. Here, the baseline of the notion door collides with a refracted translation of it; in some ways it is the collision of a literal door—a physical entryway into other spaces—and its metaphor. The effect is to draw our attention to the underlying significance of an everyday object of navigation that we take for granted, fusing its literal and more philosophical meaning as a conduit for transformation. This theme of transforming locations is an important undercurrent in much of Lyle’s work. Video projection (still) from Producing Space, 2014. 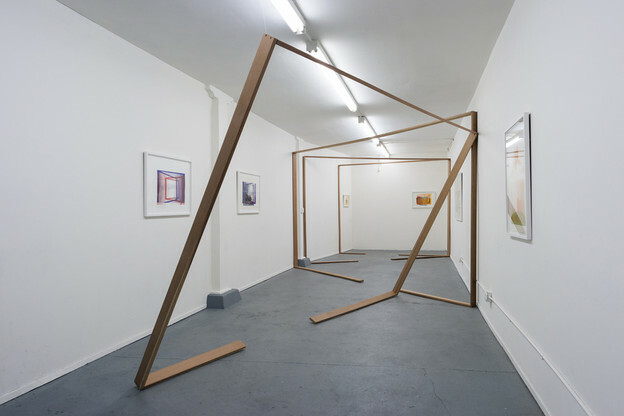 Likewise, in a group show Producing Space Lyle presents a “slideshow of a slowly shifting wood frame structure projected onto [a] half brick and half drywall corner.” It is a continuously refracted room-within-rooms, where the lines of the projected structures bend and elongate along the edge of the physical corner. Literal meets symbolic in a fluctuation of echoes, and within the projected frames—the contents in view—is another meeting point: of disparate textures, brick and drywall, an architectural moment of hybridity and intersection. This is not a coincidence: Lyle underscores the fluidity of our frameworks while also re-framing our focus onto a literal meeting point of in-betweeness, of multiple rather than singular, difference rather than homogeneity. In various other instances of interrupting and blurring mediums and materials, Lyle layers translucent landscape-printed fabric in front of windows so that the wavering distances between fabric, glass, and the commotion of outside life create a kind of live collage in constant motion, where the interactions between outside movements and the medium of the fabric are difficult to parse or pinpoint, like a world submerged in water and seen from the surface. In all of these angled and layered installations, Lyle constructs evocations of space, architecture, and seeing that are somewhat slant and oblique. Indeed, if queer is other than “normal,” then Lyle is creating rooms in which their refractions are freeing while intimate, expansive and inclusive. The title of one of these installations, Tomorrow See the Things That Never Come Today, specifically invokes the idea of seeing anew, in (time-)forward directions. It is, as Lyle says, the “transformative potential” itself, in which the experience of perceiving is enacted in a wholly new and wildly beautiful way. Her creations are aesthetically compelling: walking into one of these constructed spaces is like wandering an interior landscape, a personal wilderness, at the same time otherly and deeply one’s own. Lyle’s kaleidoscopic refractions of walls, rooms, doors, landscapes, and frameworks shift the very building blocks through we see, move, and shelter ourselves in the world. By intertwining the literal and symbolic, blurring its assumed hierarchy and incorporating this into her art, Lyle calls into question the normalized boundaries of our conventional conceptions of what is “standard” or “foundational.” She transmutes and interrupts reality and daydream in subtly aberrant ways, modifying and warping the boundaries by which we locate ourselves. She unroots us from our conventions of space, underscores their mutability, and in the process of reframing the world, she celebrates multiplicity, exploration, transfiguration—other ways of seeing and being. In her projects, it is the displacement from our anchored conceptions that is central and carries potential. In the liminal is the luminous. Redefining our world can be a disorienting experience, yet in Lyle’s visions, the spaces are actually and rightfully more nested: Even while the wood structures literally frame the body’s experience in slightly slant ways, they hold the viewer like threads of a cocoon, cradling and protecting in the way all homes are meant to do. All images are from www.cybelelyle.com. Quotations are from Lyle's artist bio or exhibition descriptions on her website.